CLEVELAND, Ohio -- What a job. John Tidyman hears that a lot. The author of five editions of the "Cleveland Golfer's Bible" and the most recent "Golf Getaways from Cleveland" still can't convince people that what he does (travel to golf courses, play golf and write about the experience) is actually work. With "Golf Getaways from Cleveland," Tidyman and a group of a reporters spent two years finding and researching places within driving distance from Cleveland that would be great for a round or two of golf. "The actual research was fun," Tidyman says. "It was a lot of work, but nobody's going to say, 'You poor guy.'" So far, Cleveland golfers aren't resentful of Tidyman's enviable profession, just really grateful that he has given them 50 great weekend golf trip ideas that won't bust their wallets or give them travel headaches. In fact, that was precisely why the book was written. "What we wondered was, in light of diminished air travel, high energy costs, and a tenuous employment situation, would golfers really appreciate a book that shows them and provides all the details for great golf outings that are nearby?" Tidyman says. Basically, Tidyman and his group then started out into the great unknown. "We had no idea what was out there when we started," he says. "We ended up with 50 great golf getaways in all of Ohio, western New York and Pennsylvania, northern West Virginia, and southern Michigan. There are resorts, bed and breakfasts, and hotel chains that are all connected with golf courses." And the places he stumbled upon sometimes led him to wonder if he fell down some rabbit hole and entered an alternate universe. Take, for instance, the Olde Stonewall Golf Club in Elwood City, Penn., which sits behind an actual castle called Shakespeare's. "You're cruising down Route 65 in Elwood City when suddenly, a huge, gray castle looms on the right," Tidyman says. "You go into this huge castle, and they have a huge dining room, and they have knights in shining armor, and flags." The place Tidyman stayed at for that trip was The Inn on Grandview Bed & Breakfast in nearby Zelienople. In the book, he tells the charming story of the owners, Juanita and Rich Eppinger, who met on a street corner there in 1953, married, and eventually bought the Inn. It's stories like these that make the book more than just a hard-and-fast golf course travel guide. The wit and off-the-cuff humor make the book a delight, too. In one chapter, he says, "Golf is more than a game, of course; it is often a fashion show, and showing up in a wrinkled Cutter & Buck shirt and Armani slacks without a crisp crease is a misdemeanor in some states." At the Eagle Crest Resort in Ypsilanti, Mich., Tidyman offers a frank assessment of his room by saying, "Let's face it: If your room has a data port, it is not for lovers." But perhaps more importantly, Tidyman demonstrates an uncanny feel for each place he visits, determining precisely who among your family and friends might best enjoy each trip. "You know, after reading one of the chapters, who that outing or getaway is for," Tidyman says. "Some of them are for you and the three guys you've been playing golf with for years where all you want is 36 holes a day, a great steak, and poker chips at night. Others are wonderful if you're taking wives or mothers-in-law." For the Chestnut Ridge Inn on the Green (Chestnut Ridge Golf Club & Tom's Run Golf Course) in Blairsville, Penn., Tidyman bluntly states his opinion on taking the kids on this trip: "If forced at gunpoint, you can take the kids, but remember: they have to be fascinated with four covered bridges in the area and shocked and delighted to learn Jimmy Stewart was born around here." Whether you're on a budget or have a big tax return check to blow, Tidyman has uncovered a course for you. If you want expensive, room rates at Nemacolin Woodlands Resort & Spa in Farmington, Penn., go from $250 to $3,000, and golf packages at the nearby Pete Dye-designed Mystic Rock Golf Course run between $165 to $606 for one day and one round. Tidyman reports that presidents have played there, and that Tiger Woods played the dedication round. "When we were pulling out of there," Tidyman observes, "it occurred to me that I, except for the kitchen help, was the only one driving a Nissan." 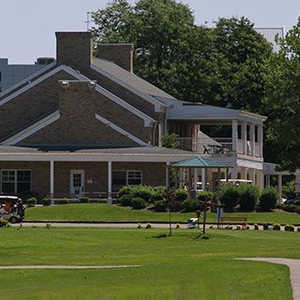 If you don't have much to spend, Tidyman suggests trying the Holiday Inn in Marietta, Ohio, and the Oxbow Golf & Country Club in nearby Belpre. While you're basking in the glow of saving a buck, you can visit eight different museums, one of which is the Historical Model Railroad and Doll Museum. The index in the back of the book allows readers to custom design their own outing by what they want. It's there that you can discover on which trip there is: Amish Country nearby, amusement parks nearby, wineries nearby, babysitting available, pets welcome, etc. Despite playing lots of golf as a result of writing the book, Tidyman still wasn't able to achieve his goal of breaking 80. 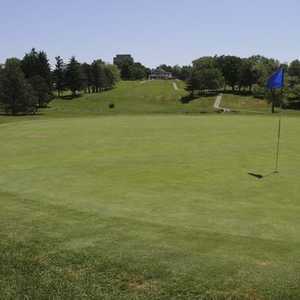 "I shot 80 at Riverside Golf Club in Pennsylvania. It was my last putt that would've given me a 79," he says. "When I do break 80, I'll just quit, throw my arms up and say, 'Take me, Lord.'" "Golf Getaways from Cleveland" is available in every major bookstore in Northeast Ohio and also at amazon.com.